With the desire to support law enforcement and these vulnerable populations, last month the White House and National Association of Counties (NACo) officially launched the White House Data-Driven Justice Initiative (DDJI). White House and NACo leaders kicked off the initiative with a policy workshop of community leaders and technologists. They discussed better ways to share data and integrate predictive analytics to keep people out of the criminal justice system altogether. Specific methods advocated at the workshop included creating pre-arrest diversion protocols, dispatching first responders to certain high-need populations, and exchanging data between health and law enforcement stakeholders. 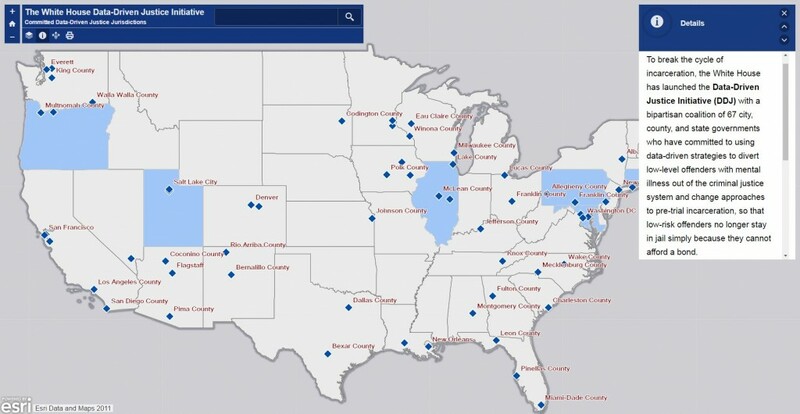 Using data collected on “super-utilizers,” or people who frequently have contact with the criminal justice system, professionals can use GIS to connect them to treatment resources within the community, instead of jail or emergency rooms. In this way, a more detailed window into the data prevents continuous and unnecessary cycles of incarceration that have no rehabilitative effect. The communities that participated in the workshop engaged in robust conversation outlining the common challenges they face and collaboratively discussing best practices and mutual solutions. Some communities were conducting hot spot analysis on 911 calls and had secure and effective data exchange figured out, but they were seeking additional technology and resources to maximize the use of that information. As part of the initiative, technologists offered software and services to support data-driven solutions developed with and for those participating communities. This week, the Data-Driven Justice communities and technologists will convene again in Washington for the first DDJI Technology and Research Consortium to further collaborate on those technical and human solutions. This last month’s efforts are just the beginning. Esri has pledged $500,000 in advanced GIS tools for the communities committed to Data-Driven Justice. To further this smart methodology, Esri and Amazon Web Services have partnered to build and provide access to many of the solutions demonstrated this week. To learn more about the White House Data-Driven Justice Initiative, visit the White House Fact Sheet.